LAS VEGAS -- A video posted on social media captured the moment the gunshots began, forcing headliner Aldean and his band to abruptly stop mid-song and leave the stage at the music festival where they were performing. The video shows people screaming as the gunman fires multiple rounds on the crowd, with one woman yelling, "Oh my god," and others calling on others to "Get down." "Tonight has been beyond horrific. 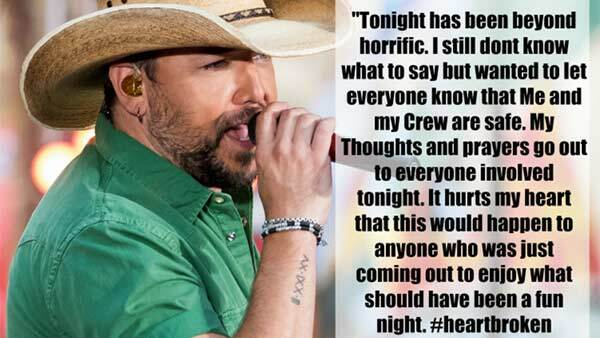 I still don't know what to say but wanted to let everyone know that me and my crew are safe," Aldean wrote on his Instagram account. "My thoughts and prayers go out to everyone involved tonight. It hurts my heart that this would happen to anyone who was just coming out to enjoy what should have been a fun night." It was the eeriest of timing. The intro guitar riff had ended and country singer Jason Aldean had just stepped to the mic to belt out the first verse of his hit, "When She Says Baby." At the same time, the rat-tat-tat of automatic gunfire filled the air. For a few seconds, no one seemed to react. His guitar strapped around his neck, Aldean sang the next line of the song -- about a woman helping him through bad days -- as dozens of gunshots, maybe as many as 50, peppered the crowd. It wasn't until the third line -- "Some days I'd rather be a no show" -- that Aldean realized something frightening was happening. He stopped singing and darted to the back of the stage. The singer, his wife, his band and crew eventually fled to safety. The crowd, some 22,000 people, gasped and looked around, confused but not yet in a state of full-blown panic. That would come shortly. 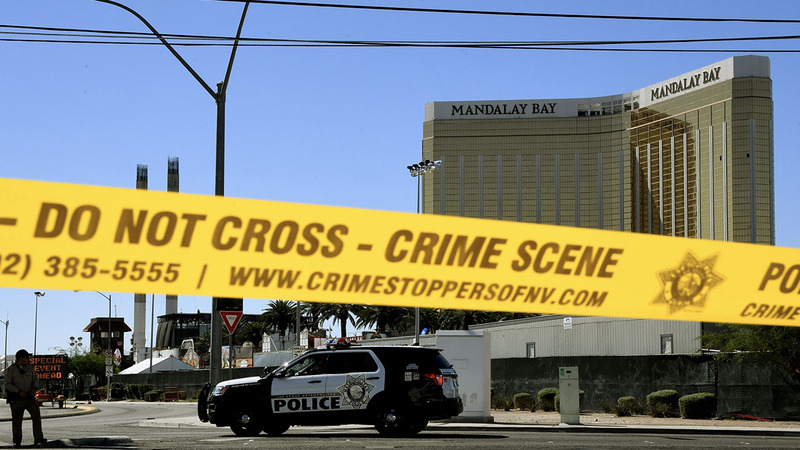 Thirty-two floors above them, behind the gilded windows of the Mandalay Bay hotel across the Las Vegas Strip, a 64-year-old man -- later identified as Stephen Paddock of Mesquite, Nevada -- was raining down bullets. By the time Paddock was dead, it was the deadliest mass shooting in US history. Aldean was the headliner, the last act on the last day of the sold-out Route 91 Harvest country music festival. Many fans had been partying at the Las Vegas Village, a 15-acre greenspace outside the MGM Grand hotel, since early Sunday afternoon. Once Aldean's band stopped, the light show carried on for a few more seconds before cutting to black. Floodlights illuminated the crowd. Still not sure what to do, some concertgoers crouched while others made their way to the edge of the festival along the Strip. Then came another, shorter volley of gunfire, and the evacuation grew more urgent. On cell phone footage, there are screams and expletives. People can be heard saying, "Don't push." SiriusXM Country radio host Storme Warren, who was watching Aldean's performance from the side of the stage, said he at first thought the gunfire was fireworks. By the third barrage of gunfire, he realized "something was wrong" and took cover beneath the stage. "The shells were hitting the deck of the stage when I was on it," he said. Before Aldean's set, Jake Owens had performed. He was still on the stage when the gunfire began. As concern morphed into chaos, he said, people began darting for cover. He could see the "fear in everyone's eyes." Owens escaped to his nearby tour bus as the bullets came down. "When the shooting started, it was ringing off the top of the stage. You could hear it hitting trailers, people scattering and it was chaos," Owens said. "Next thing you know, it was just unloading," the country singer said, "like no doubt an automatic-sounding rifle or some sort of machine gun or something. And at that point is when you could tell the chaos and the fear in everyone's eyes and their demeanor was changed and everyone just started scrambling for any sort of cover." As a second round of shots erupted, concertgoers near the stage flattened on the grass, some using their bodies as shields to protect friends and loved ones. A few occasionally popped up like prairie dogs to see what was going on. Others yelled at them to "Get down!" Corinne Lomas was one of those near the stage. She had blood on her legs from the bodies of injured people around her. "People had to fall on top of each other, whether they were alive or not," she said. "I could see a guy with a bullet wound in his neck. ... People started dropping like flies." Monique Dumas, who attended the show with her sister, said people in yellow shirts told the crowd, "Go! Go! Go! Go!" Before she fled, she saw someone on stage had been injured. "The band was rushed off the stage, the floodlights came on the crowd and you see on the right hand of the stage the person who was injured. So they're calling for medics, calling for security, then there was gunfire again," Dumas said. "The gunfire never ended, it seemed like it went on and on and on." First responders arrived, led by law enforcement carrying long rifles and wearing combat helmets. Many police officers took cover behind squad cars as they assessed the situation. Amid the trampled grass littered with plastic beer cups and water bottles, concertgoers in cowboy hats huddled together, looking for a place to hide. Others peered out from behind stanchions as mayhem spilled onto the Strip and into nearby hotels. Videos from the scene show people performing first aid on a sidewalk, women weeping on the curb, shirtless men in blue jeans helping people to safety and a man being ferried away in a wheelchair. In one image, frantic concertgoers carry a wounded woman by her ankles and elbows into the Tropicana Hotel, one of the many nearby hotels where frightened people sought refuge. Red crowd-control fences around the venue were toppled as concertgoers fled. Some people repurposed them as gurneys, using them to carrying injured people to safety. One witness told CNN affiliate KLAS there was more bedlam in the parking lot as scared concertgoers -- many separated from the rest of their parties -- hid beneath and behind cars. "My husband and I ran out toward our car, and there were people hiding underneath my car for cover," said the woman, who didn't give her name. "And there was a gentleman who was shot and he said, 'Can you help me?' And so I put him in my car and I had like six people in my car, people without shoes, running, just to get away." Judging from the descriptions and audio from the scene, CNN law enforcement analyst James Gagliano said he suspects Paddock was using a "military-style weapon" with bullets being fed into the gun via a large drum or belt. That, combined with Paddock's elevated vantage point, ensured maximum casualties, he said. As of early Monday, the casualty toll was more than 50 people killed and at least 400 injured. "He just had to point at the center (of the crowd) ... and squeeze the trigger," Gagliano said. "To use the analogy, it was like shooting fish in a barrel in that space."